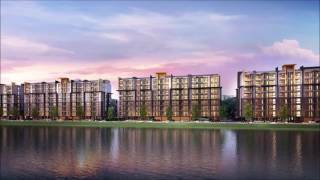 The Treasure is an exciting new project from one of Chiang Mai's leading developers which benefits from the fact that it is built on a lakeside plot. This means that all north-facing apartments in this development have views over the lake. All south-facing units have views over the project's swimming pools - so whichever direction your apartment is facing, beautiful views are guaranteed. The project is located in the highly desirable Chiang Mai Business Project area, close to the city's new business parks. The Treasure is ideal for those who love to shop as it is less than 200m from Chiang Mai's largest hypermarket, Big C Extra, making grocery shopping a breeze. For other items, Chiang Mai's best shopping mall, Central Festival, is also located just 750m from here. There are many other top quality amenities in the local area, including Bangkok Hospital - the best in the city. The area also offers easy access to the city's bus and railway stations, with Chiang Mai's historic old town and the international airport just 20 minutes' drive from here. There is also easy access to several quality international schools from here. As a result of its unique lakeside location, close proximity to Big C Extra and Central Festival Shopping Mall plus the high standard of facilities and finishing, high rental demand is expected for The Treasure for those looking to buy as an investment rather than as a comfortable home for themselves in the city. Such is the desirability of The Treasure that sales on the project have been very fast, with over 70% of apartments sold out already. As a result, if you wish to buy into this exceptional project, then prompt action is highly recommended.